The remnants of a picnic lunch sit on a blanket. Mom shades her eyes as Junior calls out for her to watch. Dad fires up the boat pulling Junior along in an inner tube. He picks up speed and they all laugh as Junior struggles to hang on. Most likely the day will be remembered for laughs and fun; sunburn and perhaps a bruise or two are all the family fears. Sadly, tubing accidents can turn this seemingly idyllic summer scene tragic in mere moments. As we look at the threat, the hearts of our Sonoma County drowning injury lawyer and legal team go out to a grieving family that will never look at a day on the lake the same again. On Monday, the Santa Rosa Press Democrat reported that a dive team had recovered the body of a 14 year-old San Francisco boy who had been missing since July 4th. According to reports, the boy and his younger cousin had been playing on inflatable toys during a Lake Sonoma gathering when they drifted further than they intended. After persuading 13 year-old aboard a personal watercraft to tow them to shore, the boys lost their grip on the rope and slipped into the water. Neither boy could swim; neither was wearing a life jacket. The survivor reports he initially panicked and held onto his cousin, but the pair separated. The younger boy made it to shore. His cousin never followed. There appear to be many factors at play in the terrible incident at Lake Sonoma, the Lake’s first drowning since 2009. It is not clear exactly what types of inflatable toys were being used and whether those toys carried appropriate warning labels. Further, state law requires operators be at least 16 years old to operate a personal watercraft solo. Children ages 12 to 15 may operate a two-person watercraft with an adult’s supervision. These factors could only exacerbate the dangers of more typical water tubing. Water tubing, as we will use the term, involves one or more individuals riding an inflatable inner tube while being pulled by a tow rope extending from a boat. In 2013, researchers at Nationwide Children’s Hospital shared their findings from a 19-year study of water tubing accidents. Noting the rising number of participants, the researchers reported a 250% increase in the number of water tubing injuries from 2,068 injuries in 1991 to 7,216 injuries in 2009. Since more than 83% of the injury-causing incidents occurred during the summer months, this translates into more than 65 people arriving in emergency rooms because of tubing injuries every summer day. Looking more closely at the reported injuries, researchers found that the head (27%) and upper extremities (24%) were the most frequently injured parts of the body. The most common types of injuries were sprains/strains (27%) and soft tissue injuries (16%). Nearly half of all water tubing injuries resulted from contact with the water while contact with another individual accounted for 16% of the injuries. Parsing the results by age, researchers found people under age 20 tended to suffer head injuries and were more likely to be injured during contact with another participant while adults tended to suffer knee injuries and be injured by contact with the water. Researchers suggest several reasons for the increase in injuries beyond the simple increase in tubing participants. Co-author Lara McKenzie, PhD. 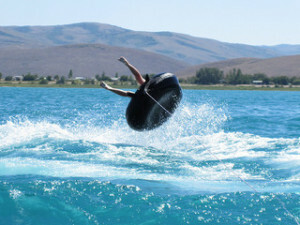 pointed to the inability of the rider to control direction and/or speed, the positioning of riders on the tube, and the number of riders aboard each tube as key factors in tubing accidents. There may be a number of civil claims available to people injured while water tubing including claims based on product liability and traditional negligence theories. Manufacturers, rental companies, and negligent boat operators are among those who might be legally responsible for a tubing tragedy. We strongly believe that, in addition to compensating the injured and the grieving, civil litigation can prevent future tragedies by holding individuals/entities accountable for their actions and providing a warning to others who might engage in similar behaviors. If you or someone you love is involved in a tubing accident in Sonoma or elsewhere in our region, please call our Northern California recreational law firm in Santa Rosa, San Francisco, or Oakland. We help families get through the hardest days of their lives.